This Womens swing style blouse looks great on all body types. It is a casual style that has a simple round neckline and long bell sleeves. The sleeves are fitted from the shoulders to the elbows where they are met by a single band of semi-sheer black lace over the elbows. The bottoms of the sleeves bell out gracefully and end at the wrists. 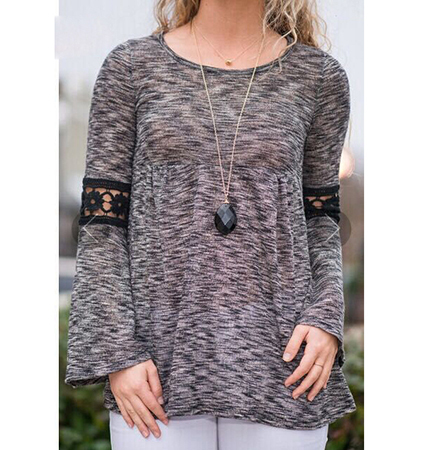 This blouse is presented in a lovely heathered gray and black. It is machine washable in cold water and may be tumbled dry on low heat. The blouse is available for purchase in sizes Small, Medium, Large and Extra Large.